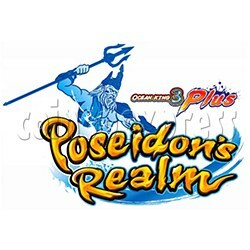 Ocean King 3 Plus: Poseidon Realm Full Game board kit China release version is the latest in the Ocean King 3 Plus series. It can be configured for 6, 8, and 10 players. The player controls include a joystick to aim their guns at the various fish on the screen. The “Choose Weapon” button allows the player to choose what kind of weapon to use to catch the fish. The higher the point value will increase the weapons strength allowing the player to catch more fish. There are five different types of Crabs that will either increase the number of fish caught or will give the player bonus points. There are plenty of bonus rounds and features that keep everyone hunting.